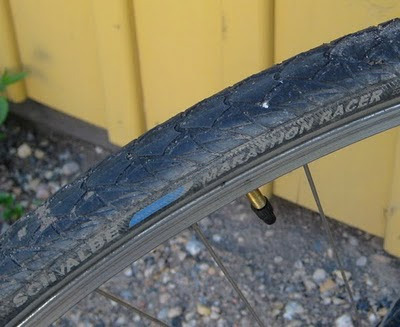 This spring I’ve had the opportunity to try out a pair of Schwalbe Marathon Racer tires (thanks to Ryan from Bicycle Smile and Schwalbe) and I LOVE them. This is the first set of Schwalbes I’ve owned. I tend to be a creature of habit – finding something that works and using the same product relentlessly until they stop making them or the product fails me. My usual tire of choice failed me last summer so I was willing to try something new. Sooooo wishing I’d tired these earlier! The ones I have are of the folding bead, 700x30 variety. I do like folding tires. I’m not sure why. I’m generally not a weight weenie, but I do like tires that don’t make me feel like I’m driving a tank. 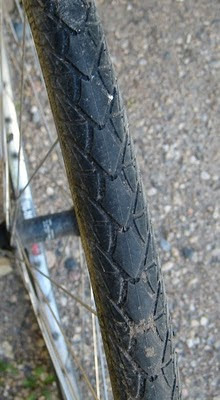 I do notice that I can get going easier with lighter tires. These do not make me feel like I’m driving a tank at all. The nearly complete lack of tread (I’m sure the grooves of the tire “tread” are just there for show to convince people who only know car tires, and are therefore afraid of slicks, that they will not slip out in the rain) also helps with the completely non-tank-like feeling by providing some really low rolling resistance. If installing the first one had been as troublesome as the second I may have given up right then and there! Luckily the first one went on like a dream – seriously I’ve never had a folding tire straight out of the box go onto a wheel with so little effort! The second one… well... I’ll chalk that up to a cold early spring out in my chilly (unheated) garage – by the time I got to the second one both my hands and the tire were getting pretty cold and putting it one was… well… a bit more challenging. I’ve been riding these since early spring and it’s been an odd spring here in Saskatoon. We’ve had a lot of late snowfalls (a few after I took off the winter tire and installed these). 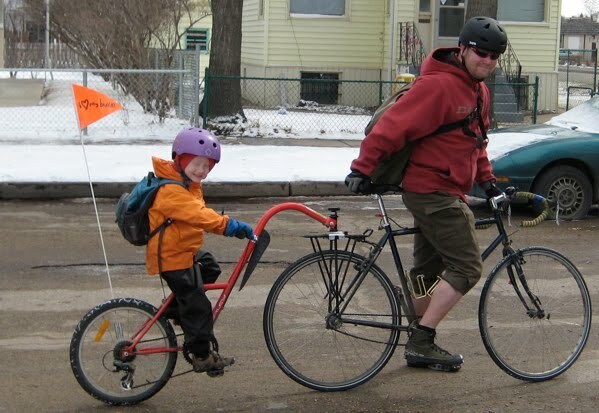 Not enough for there to be a buil up of snow or great sheets of ice like we have in the middle of the winter – but slippery enough for a few extra fender benders around the city for a day or two. We’ve also had a whole lot of rain! I have had no issues with tires slipping out or anything. I have these on my get-a-round city bike, which I regularly haul a bike train made up of a trailer bike and a trailer with a kid on/in each – plus all the gear we need for wherever we’re going and/or picking up groceries on the way home. That’s a lot of weight to get going and a lot of momentum pushing when trying to slow down, but I have never had anything but solid contact with the road on these tires. There’s also been an unusually large amount of gravel, rubbish and glass on the roads this spring – especially the glass. 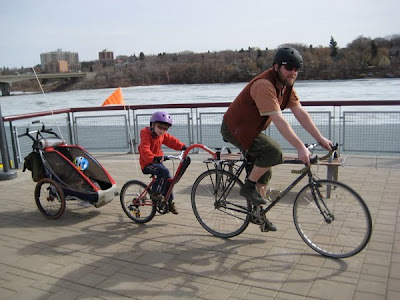 I’ve flatted tires on all my other bikes (at least once) – even both the trailer bike and trailer I tow behind my get-a-round bike! No problems with the Schwalbes so far. Another nice little touch that I really dig – considering it’s my get-a-round city bike that I tow the kids around on – are the reflective strips that run all the way around the sidewalls. 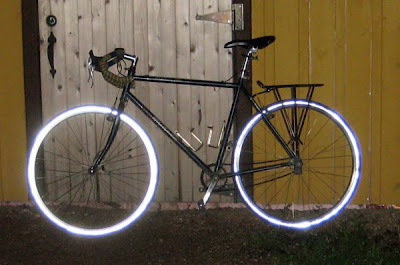 They REALLY light up – even when they’re as dirty as mine!! Not so awesome if you’re robbing convenience stores at night and using you’re bike as a getaway vehicle, but pretty sweet if you WANT to be SEEN at night! 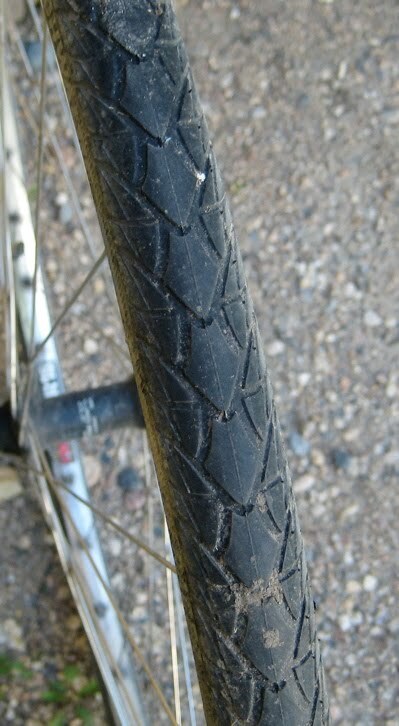 What do these tires retail for? Who carries them in town? I think the suggested retail was in the $60US range. I know Bike Doctor carried Schwalbes. Others may very well have, or be able to get, them as well. Ryan from Bicycle Smile set me up with these to review. I like the bike so cool...Nice choice!!! Just ordered a pair of Schwalbe Racers for my cross bike after reading your review and some other opinions from the net. Thanks for sharing your thoughts. 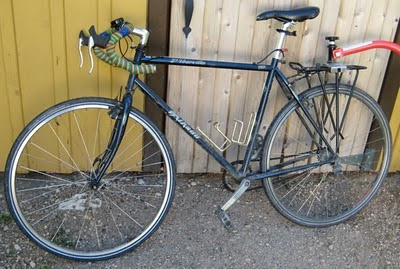 Welcome to Tim's Bike Blog. 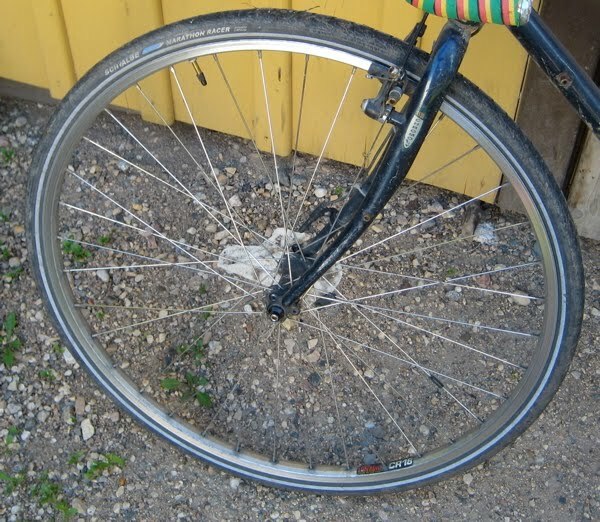 Here you will find pictures and prattling about... well... bicycles.